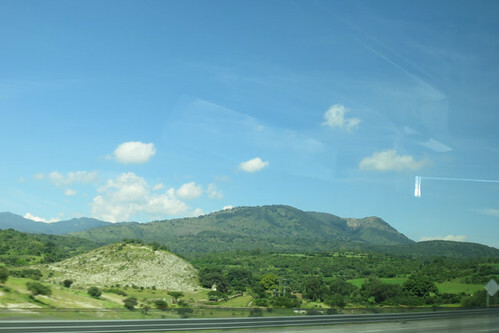 Yesterday I left Mexico City en route to Querétaro. This time I took a Flecha Amarilla. This is a second class bus. It was only $7.50 for students and teachers. It is similar to first class, except you are not provided with lunch and you don’t have WiFi. It was not a big deal. The seats were still very comfortable and we watched a Disney nature documentary called African Cats. Here is a shot of the aqueduct. This aqueduct is the SYMBOL of the city. It is gigantic and composed of a total of 74 arches. The aqueduct was constructed in the 17th century as a means of transporting fresh drinking water. I heard some people say it is still functioning, but I will get back to you with that exact answer at a later date. This morning I woke up with plenty of energy. I wanted to explore a bit of the town, so I grabbed my camera and hit the streets. 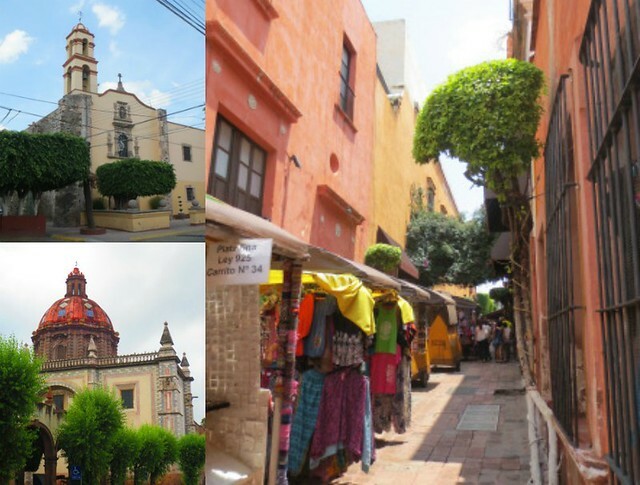 Walking around Querétaro is like a dream. It has all of the colonial charm that you would find in Rome with its winding cobblestone streets and historic churches. 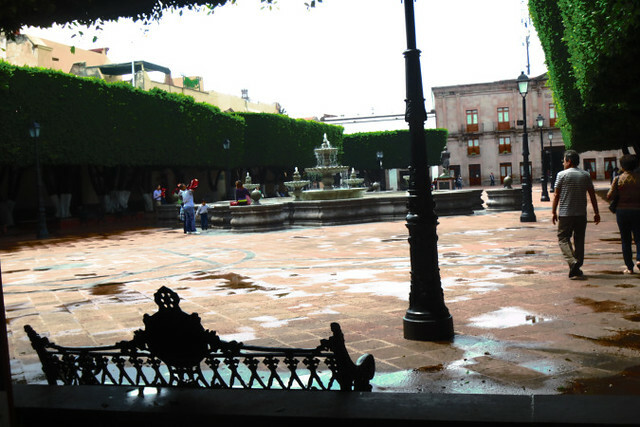 I stopped at Jardin Guerrero to check out a few shops and buy a water. It is VERY hot and dry here compared to Mexico City, so I needed to keep hydrating. This plaza is absolutely beautiful and has free WiFi. I can definitely picture myself having a coffee here in a future, while I read a book or work on my computer. 🙂 From there I went to El Museo de la Ciudad. It is free on Sundays. 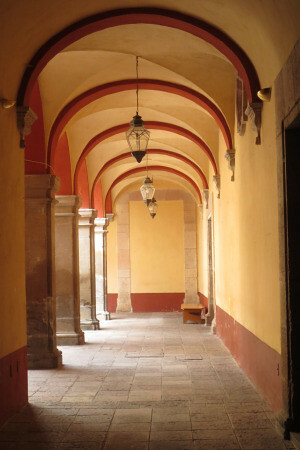 The building itself is attached to a convent built in the 15th century. Walking around the building was spectacular enough, even without the artwork. This museum also has an event calendar that is COMPLETELY PACKED with cultural activities. There are theater shows, music, dance and a variety of classes to take. I don’t think I will become bored in this city. 😀 For example, this week there is an International Film Festival and each night they are showcasing a different foreign film. I’d like to go at least once this week. Here are a few of the painted cow skulls. The one on the left has two bunnies eating away at the skull. I have to admit, it is quite far from school. I plan on buying a bicycle tomorrow. Anyway, the air up here is so fresh. The community is very quiet and posh. The views are absolutely spectacular! It is worth the hike! Anyway, I have lots of unpacking to do tonight. I will also have lots of things to do tomorrow INCLUDING buying a bicycle. I will arrive at the school at 8 am to begin learning the curriculum and also start my work permit. There will be A LOT of paperwork, but it is all very exciting. Enjoy the rest of your night!